In the last 18 months or so, I have been on a quest to become more proficient at practicing radical self-love by committing more of my time and energy towards the things that bring me a sense of inner peace and overall well-being. Though this path has not been without its fair share of roadblocks, detours and bumps in the road, I have been able to dump a lot of weight (both physical and otherwise) on the side of the highway, and for that, I am grateful. It's amazing how good it feels to say "YES" to exercising regularly, eating clean, getting a full night of sleep, spending time at the spa, getting away for the weekend, sharing quality time with loving and supportive people, doing purposeful work and tapping into the Spirit that lives within on a daily basis. However, as good as all of that sounds, I am discovering that these outward manifestations of self-care only scratch the surface of truly learning to love myself. 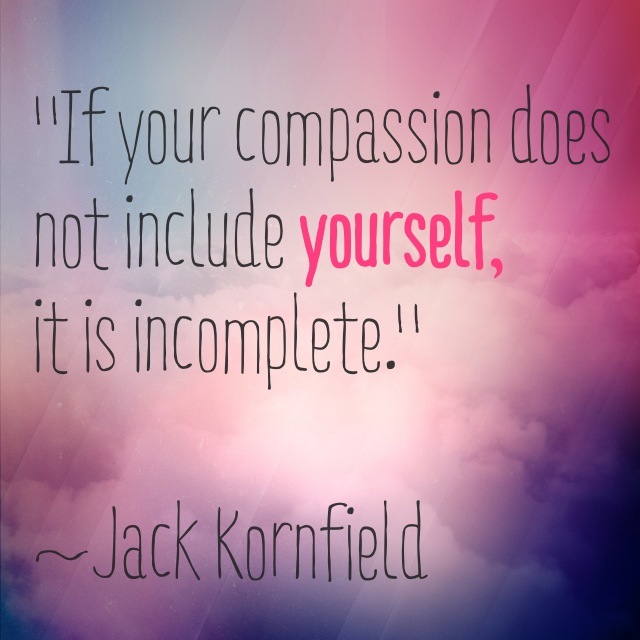 Last night, I heard this quote for the very first time: "If your compassion does not include yourself, it is incomplete." 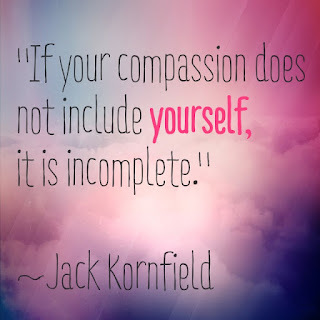 Those words jumped out at me and have been resonating with me for the last several hours, as I ponder, "Does my sense of compassion include me?" "A disposition to be kind and forgiving...." Have I always been kind and forgiving towards myself? If I am to be completely honest with myself (and you), I would have to say no. I have been known to beat myself up over all that I perceive as "wrongs" in my life: financial decisions, career choices, eating habits, relationship disasters, etc., etc., etc., and so on. While I know that it is common for an individual to be his or her own worst critic/enemy, where does that mindset stem from? In all fairness, personal negativity oftentimes comes from things that others have said that we have internalized and accepted as truth. In my case, the negative self-talk is the fruit of years of refusing to forgive myself for past mistakes. As Maya Angelou used to say, "When you know better, you do better," so I am going to begin practicing self-compassion by letting go of unforgiveness and embracing my right to be fully human and perfectly imperfect. Between my 49th and 50th birthdays, I am embarking on a daily journey of gratefulness as there is always something, great or small, to express gratitude for. I have dubbed this journey The Grateful 49 Project, as I will endeavor to share my thoughts in approximately 49 words or less (on most days).